Contractor Availability: Most homeowners think about home improvement in spring and summer, but that doesn’t mean winter isn’t an option. Quite the contrary, actually. For many reasons, winter is actually the best time to address home improvement. For starters, contractors tend to have more openings, meaning you will not have to wait and wait and wait for your new fence. Less Disruption: Let’s face it; during the winter, you probably aren’t planning on spending much time outdoors, especially in your backyard. Because you spend most of your time indoors, winter fence installation is less likely to disrupt your day-to-day life. The same cannot be said for spring and summer, when the weather is as close to perfect as it can get. Ready When You Want It: If you wait until spring or summer to schedule an installation you will not be able to enjoy the full potential of your fence. 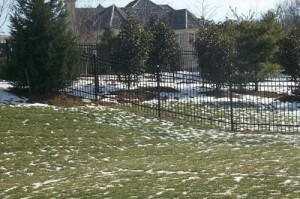 When you opt for winter fence installation, your fence will be ready on the first day of spring. Winter fence installation is as easy to do in winter as it is in the summer. So why wait until spring to get your new fence? Since 1955, Hercules Fence of Northern Virginia has been providing professional fence services and installation throughout Northern Virginia. We take great pride in our work and can handle all of your winter fence installation needs: Custom Wood Fences,Ornamental Steel Fences, Ornamental Aluminum Fences, PVC Vinyl Fences, Chain Link Fences, and more. Plus, as the largest fence company based in Northern Virginia, Hercules Fences has the ability to buy fencing products you want at a price you’ll love. That’s what we call a win-win! If you have any questions about Winter Fence Installation, please contact Hercules Fence of Fairfax County , Virginia today by calling (703)551-2609 or visiting our website. Also, check out Hercules Fence of Manassas on Facebook,Twitter, Google+ and YouTube! This entry was posted on Saturday, January 17th, 2015 at 3:54 pm. Both comments and pings are currently closed.